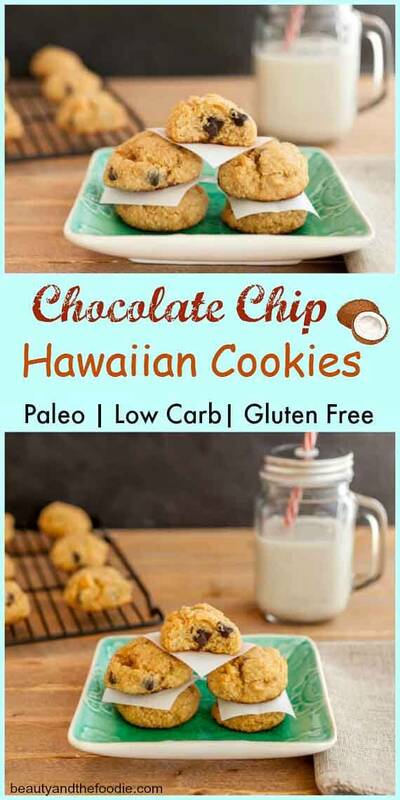 A grain free, gluten free, chocolate chip coconut macadamia nut cookie, with paleo and low carb options. 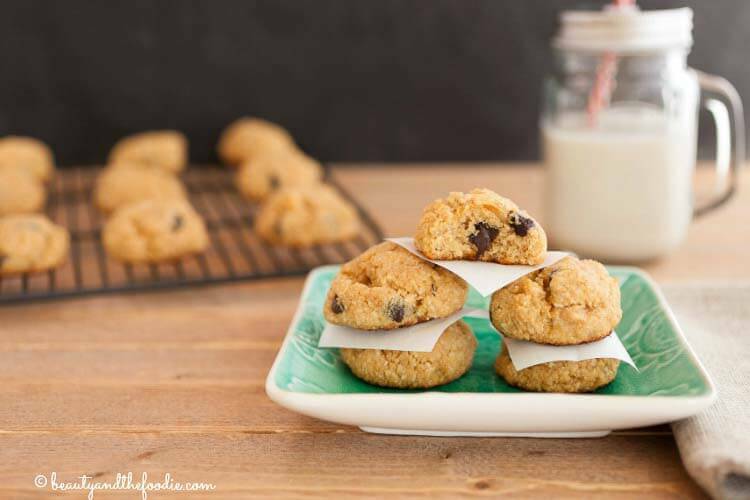 Chocolate Chip Hawaiian Cookies are grain free, low carb, and ridiculously good! 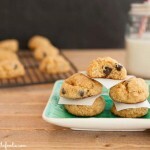 These tropical inspired treats have chocolate chips, coconut, and chopped macadamia nuts. The recipe includes a paleo and a low carb version. These are also good without the macadamia nuts, according to my youngest son, who picked all the macadamia nuts out of his cookie. I had to remake this recipe 3 times before I could get the perfect cookie texture. Well, it should have been 2 times, because I did not hear the oven timer go off on one of the batches, and incinerated the cookies. Oh, that almost made me cry! Don’t you hate it when you wander away from the oven and burn something so bad that it is inedible? Please let me know I’m not alone, and share your best “I ruined the food” stories in the comment section. Preheat oven to 325 F, and line 2 baking sheets with parchment paper or silicon baking mats. In a large mixing bowl with electric hand beater or a stand mixer, cream butter and granulated sweetener of choice until well combined. Add lg egg, molasses, and vanilla extract to mixing bowl and mix in until combined. In a separate large mixing bowl combine: almond flour, coconut flour, shredded coconut, baking powder,and sea salt. Stir until combined. Fold in chocolate chips and macadamia nuts. bake for 12 to 15 minutes, or until cookies are browned on the bottoms. Remove and cool for at least 25 minutes or longer, or until cookies firm up and set. Nutritional Data for Low Carb Version (using Swerve sweetener and Lilly’s chocolate chips): Servings: 24, Serving Size: 1, Cal: 82, Carbs: 2.8 g, Net Carbs: 1.8 g, Fiber: 1 g, Fat: 8 g, Protein: 2 g, Sugars: 1 g, Sodium: 64 mg.
Nutritional Data for Paleo Version (using coconut sugar and Enjoy life chocolate chips): Servings: 24, Serving Size: 1, Cal: 116, Carbs: 9, Net Carbs: 8 g, Fiber: 1 g, Fat 8 g, Protein: 2 g, Sugars: 7 g, Sodium: 64 mg.
Nutritional data below is for low carb version. Paleo data is above recipe card in post. Many years ago I was slow-cooking a stew on the stove. It looked great and smelled great too. At the very end, I went to sprinkle in some cornstarch to thicken it up. The whole pot started foaming and spilling over the edge and all over the stove top. I accidentally put in baking soda instead of corn starch! What a mess… and a waste of food!! Rain, I love that story. I have done a similar thing as well. I thought I was putting pumpkin pie spice into some muffins, and late discovered that I had accidentally used curry spice instead. They were surprisingly tasted okay with curry in them. I made the paleo version tonight and they turned out so good! I’d say that they have the best texture out of all the paleo cooking that I have made. Awesome! Linsy, Thank you for the lovely comment. I can’t tell you how many batches of failed paleo cookies it has taken to get a cookie that actually has the texture of a conventional cookie. It has been an expensive journey, lol.